As I’ve discussed before, the patterns of use and importation of chipped stone at Chaco are somewhat puzzling. Unlike many other commodities, such as wood, corn, and pottery, which were imported from specific distant locations within the Chacoan sphere of influence in astonishing quantities during the height of Chaco’s regional power, chipped stone seems to have been largely a mundane, utilitarian concern. Throughout all periods of Chaco’s occupation most chipped stone was local. 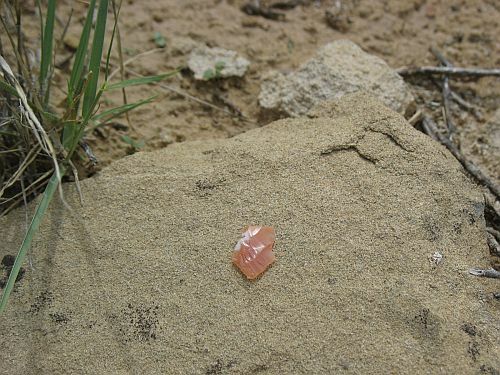 At Chaco’s peak of power and influence between AD 1020 and 1130 there was a slight uptick in imports of stone, particularly a distinctive pink chert from the Narbona Pass area to the west. As I noted in the earlier post, however, obsidian follows a different pattern from the other imported stones. It is most common not at the height of Chaco’s regional power in the eleventh century but much earlier, in the Basketmaker III period between AD 500 and 750, when it is the most common nonlocal type of chipped stone. This was a time when Chaco may have seen an earlier period of regional importance, although figuring out what was going on at this time is very difficult for several reasons. By the Pueblo I period the amount of obsidian seems to drop precipitously, and it doesn’t start to recover until the very end of Chaco’s period of Pueblo occupation after AD 1120. This pattern puts obsidian decidedly out of phase with most other material culture imports to the canyon, which tend to correlate with the well-known evidence for social complexity and monumental architecture that we associate with the Chaco Phenomenon. A recent paper by Andrew Duff, Jeremy Moss, Tom Windes, John Kantner, and Steven Shackley tries to put the obsidian evidence on a firmer footing by using geochemical sourcing to identify the source outcrops for a broad sample of obsidian found at Chaco and at various Chacoan outlier communities in the San Juan Basin. As they note, this is the latest chapter in a complicated story. Way back in the 1980s, the Chaco Project did an extensive sourcing study of obsidian found in its excavations in the canyon using X-ray fluorescence (XRF), a non-destructive sourcing technique that was then relatively new in archaeology. Their results, reported by Cathy Cameron in a number of publications, were surprising. They seemed to show that the closest source of obsidian, Mt. 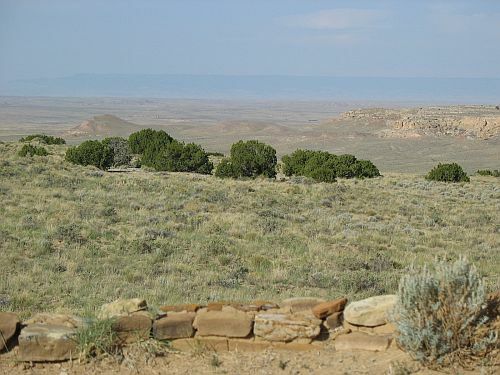 Taylor, provided very little of the obsidian found at Chaco (about 4%), while a distant source, Red Hill in Catron County, New Mexico, provided a very high proportion, especially in the assemblages from earlier sites. Also well-represented was obsidian from the Jemez Mountains, the second-closest source, with the proportion of Jemez obsidian increasing over time, a common pattern in the northern Southwest. This seemed to indicate that there were substantial early ties between Chaco and the Red Hill area, far to the south but still just barely adjacent to some known Chacoan outliers. This result was mentioned in many publications on Chaco over the years, although many people didn’t really seem to know what to think of it. However, it soon began to be questioned. 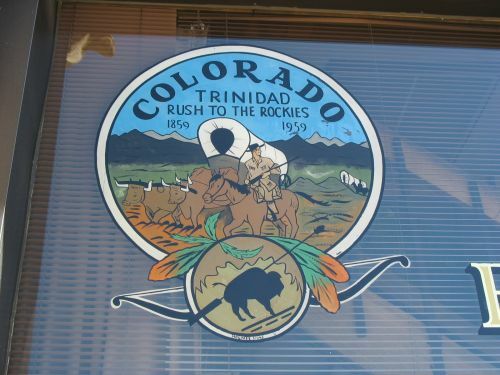 After this initial sourcing study had been done, Tom Windes submitted some samples of obsidian from Pueblo Alto and the Spadefoot Toad site for obsidian hydration dating, which involved a sourcing analysis as an intermediate step in the dating process. 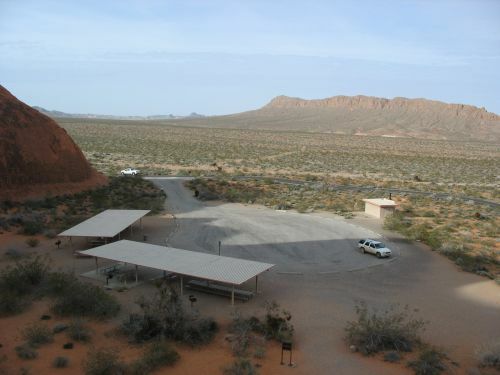 These analyses were inconclusive when it came to dating the artifacts (not uncommon in the Southwest, where obsidian hydration has a poor record as a dating technique), but the sourcing portion suggested strongly that the samples that had previously been sourced to Red Hill instead came from Mt. Taylor. Windes mentioned this anomaly in his site reports, as did Cameron in her subsequent publications on the subject, but a full published account didn’t appear until this new study. The new study also used XRF to do the sourcing analysis, but both analytical techniques and source characterizations have improved considerably since the 1980s, so the results were quite different from the first effort. For some reason this study was unable to do a complete reanalysis of the earlier samples (although it implies that this may be possible in the future), so there was only limited overlap and the focus was mostly on recent samples collected by Windes at Basketmaker III and Pueblo I site in and around Chaco, as well as outlier sites studied by Kantner in the Red Mesa Valley near Mt. Taylor and by Duff at the southern edge of the Colorado Plateau near Red Hill. The results were not really surprising, in that they have been known in broad outline since Windes submitted his samples for dating and reported on the sourcing anomalies, but it’s nice to see them formalized in a peer-reviewed paper. 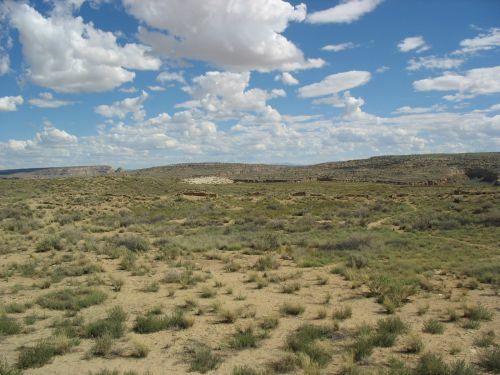 Basically, this study found that no samples from Chaco came from Red Hill, although a few came from other sources in the same general area, and that the most common source found at Chaco was Mt. Taylor. Over time there was a trend in the Chaco data showing a shift from Mt. Taylor to Jemez sources, accompanied by the well-known trend toward less obsidian in assemblages overall. 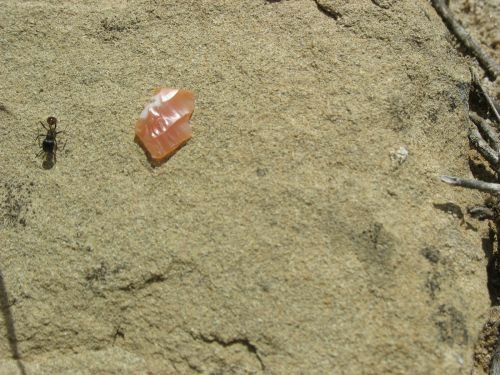 The sample from the Blue J site near Mt. 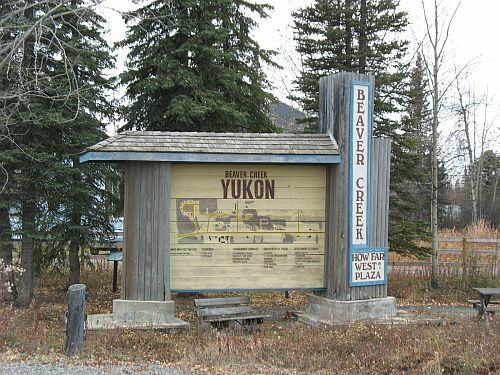 Taylor, in contrast, showed high proportions of Mt. Taylor obsidian increasing over time, in marked contrast to the Chaco pattern. 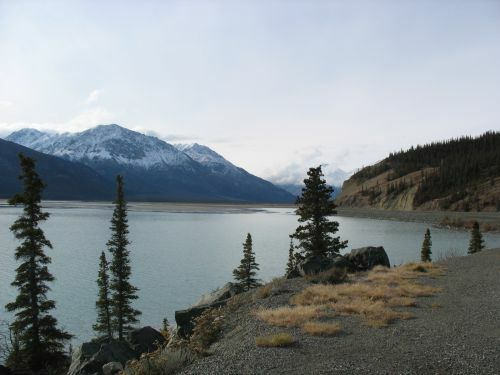 The southern sites showed assemblages of obsidian almost entirely composed of Red Hill and other nearby sources. Basically, the overall pattern was a classic distance-decay distribution, where the prevalence of a given source at a given site was mostly predictable by the distance between the source and the site. This is in sharp contrast to the pattern for many other imported goods at Chaco, which are present in high quantities in the source areas and at Chaco but not in between. This suggests strongly that obsidian was not part of any general Chacoan exchange system(s) but was procured by individual communities in accordance with their own needs, mostly using the closest sources. This is in keeping with the general tendency for chipped stone to be a relatively low-priority commodity in these societies. The overall decrease in obsidian use noted at Chaco sites may reflect a shift in technological focus away from hunting and a subsequent focus on grinding technology as agriculture becomes the dominant subsistence strategy. As I’ve noted before, this is almost certainly wrong; the decrease in question occurs at the end of the Basketmaker III period, at which time there is considerable evidence that Southwestern populations were already heavily dependent on agriculture. The decrease in obsidian is still odd, though. One thought I’ve had to explain it is that maybe the obsidian from after this period isn’t actually missing at all, but is at Pueblo Bonito, which had lots of obsidian but was excavated a long time ago using techniques that aren’t really comparable to the modern techniques used by the Chaco Project and later efforts that resulted in the collections being analyzed here. I would suggest that an XRF sourcing analysis of the Bonito obsidian would be interesting. As it is, there’s a huge shift in the proportions of the different sources at Chaco between Basketmaker III and Pueblo I. The earlier samples (dominated by the huge samples from the major villages of Shabik’eschee and 29SJ423) show a predominance of Mt. Taylor obsidian, while the later ones show mostly Jemez sources. The sample size is so much smaller for the later period, however, that I’m skeptical about taking this flip at face value. Including the Bonito assemblage might help to bridge this gap, or at least explain it. Finally, it’s again noteworthy how unimportant obsidian appears to have been to the Chaco system. 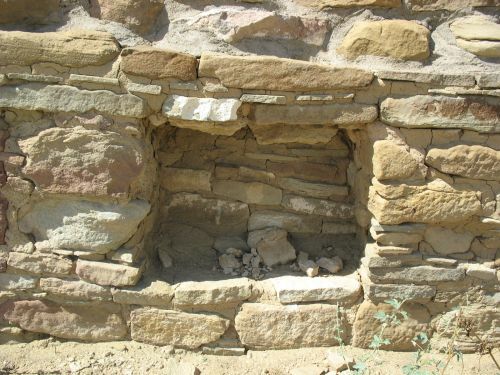 Even if the Pueblo Bonito evidence ends up indicating a more important role at Chaco itself, the various outlier communities appear to have used local sources and to have followed their own priorities in acquiring this commodity rather than getting it through any Chaco-controlled or -oriented system. This is one of the ways that Chaco appears to diverge from Mesoamerican societies, despite recent evidence that it may have had more contact with them than was previously believed. Obsidian was hugely important symbolically in Mexico, and control of major sources was a major source of power and wealth for various Mesoamerican polities. In the Southwest, however, nobody seems to have cared that much about controlling major obsidian sources, and obsidian seems to have been distributed as a fairly ordinary commodity without any particular symbolic importance. I think this is one of the strongest pieces of evidence suggesting that whatever influence Mesoamerican societies may have had on Chaco was indirect and mediated by Chacoan elites rather than imposed directly from Mexico, as some have argued. In any case, while this isn’t really the most exciting paper, it’s still an important one in straightening out a part of Chacoan archaeology that had become pretty confused. Obsidian may not have been all that important at Chaco, but it’s still worth studying in part precisely because of its mundanity. Many recent interpretations of Chaco Canyon see it as a site of pilgrimage, and this is often specifically seen as taking the form of regular region-wide ritual events involving communal feasting, construction work on the massive buildings in the canyon, trade involving various mundane and exotic items, and ritual breakage of pottery and deposition of it in the mounds accompanying most great houses. This idea, which has been incorporated into a wide range of models of Chacoan society both hierarchical and egalitarian (although it is especially important to egalitarian models), is heavily dependent on data gathered in the excavation of Pueblo Alto by the Chaco Project in the 1970s. In addition to excavating about 10% of the great house itself, Project personnel excavated a trench and several stratigraphic columns in the large trash mound to the southeast. What they found was a series of well-defined layers. Some of these, toward the bottom, seemed to consist mostly of construction debris, and others, toward the top, consisted mostly of windblown sand and redeposited artifacts, but the ones in between seemed to show a pattern of large, well-defined deposits. This was interpreted as being quite different from the expected pattern from the regular deposition of domestic trash from a residential site, and the theory developed, particularly by Wolky Toll, explained it as the result of occasional massive depositional events in which large amounts of pottery and other artifacts were deposited all at once. Toll estimated that the number of layers approximately matched the number of years during which Pueblo Alto was occupied, and that they therefore accumulated as the result of annual events in which numerous people came from throughout the region to attend events at Pueblo Alto (and presumably at other great houses too). As part of these events, pilgrims would probably have brought offerings of items from their home areas, thus explaining the huge amount of imported goods at Chaco as well as the lack of apparent exports. 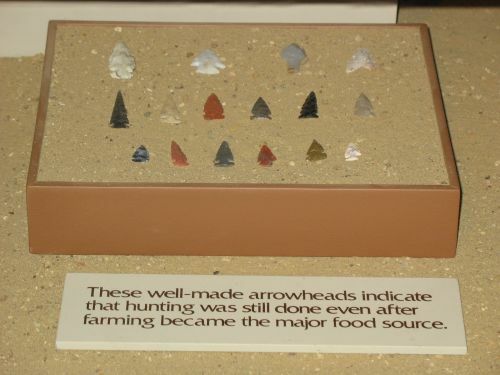 These items would have included mundane items like wood, corn, and pottery, as well as more exotic things like turquoise and Narbona Pass chert. People may have also worked on constructing the great houses as part of some sort of ritual offering of labor, which would explain the massive scale of these buildings despite the small permanent population of the canyon itself. 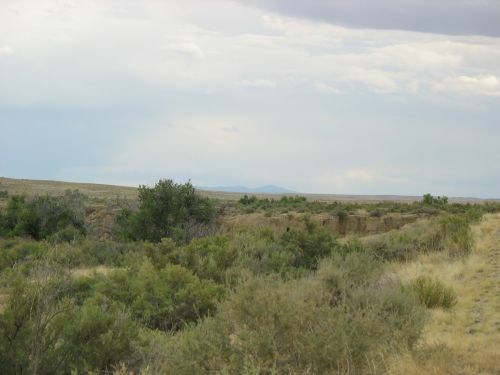 While there is a certain amount of evidence for residential use at Pueblo Alto and other great houses, it indicates a pretty small population relative to the size of the buildings, and Toll’s model interprets this as a small “caretaker” population of what were primarily non-residential, public structures with large plazas that could serve as the sites of ritual feasting and other activities during these festivals. Furthermore, the composition of the artifact assemblage found during the excavations of the Pueblo Alto mound seemed to offer an interesting possibility for another ritual activity. Basically, there was a huge amount of pottery in it, especially gray utility ware, much of it imported from the Chuska Mountains to the west. Based on the number of rim sherds in the excavated portion and an estimate of the size of the whole mound, Toll calculated that 150,000 vessels were used during the 60-year period (AD 1040 to 1100) during which Gallup Black-on-white was the predominant decorated type, a period that roughly corresponds to the height of the Chaco system. This works out to 2500 vessels a year, or 125 for each of the 20 households estimated to have lived at Pueblo Alto at any one time. This is a huge number compared to ethnographically documented rates of pottery usage and breakage or ratios seen at small sites, and to Toll it suggested that the pottery deposited in the mound was probably not broken in the course of everyday life at Pueblo Alto but was instead broken deliberately in rituals associated with the annual pilgrimage fairs. Ritual breakage and deposition of pottery is a known Pueblo practice, but this would be on a scale not seen at any other known site. Nevertheless, this is the model of the formation of the Pueblo Alto mound that has been widely accepted and incorporated into a wide variety of interpretations of the Chaco system that differ wildly in many respects but all have some sort of pilgrimage function for the canyon as part of its regional role. It’s important to note that this is the only direct evidence for a pilgrimage function known from excavations at Chaco. I think it’s pretty plausible that pilgrimage and communal feasting took place at Chaco, but I’ve increasingly come to think that the evidence from the Pueblo Alto mound is extremely weak. There are a few different reasons I don’t buy it, and a couple of the most important ones are well illustrated by two articles published in American Antiquity in 2001. One of these, by Toll himself, is part of the same special issue on the organization of production at Chaco that included Colin Renfrew‘s model of Chaco as a “Location of High Devotional Expression” or pilgrimage center. Toll likes this idea, obviously, and his article, in addition to summarizing the known data on the production and use of pottery at Chaco, attempts to take a closer look at the Alto data to evaluate Renfrew’s model. This basically involves looking at each of the “event layers” (as distinguished from the construction and post-occupational layers) and calculating the proportions of local and non-local ceramics and lithics (as well as the different types of pottery forms and wares) in each. These were then compared to the proportions in the mound as a whole, other Chaco Project excavations dating from the same period, and excavations dating earlier and later. If Renfrew’s theory works, the event layers should show higher proportions of imported ceramics and lithics, as well as possibly higher proportions of ceramic types likely to have been used in feasting, compared to these other data sets. Toll does his best to spin the results to be consistent with Renfrew’s model, but looking at the actual numbers in his tables, there’s just nothing there. The event layers are virtually identical to the whole mound, which isn’t really surprising given that they comprise a large portion of it, and both are very similar to contemporary non-mound contexts in most ways. Earlier and later contexts are different in interesting ways, but that’s neither here nor there in terms of evaluating Renfrew’s model. Chuska ceramics are a case in point: they comprise 33.4% of the event layers, 30.8% of the whole mound, and 33.1% of the contemporary non-mound contexts. That doesn’t look like a meaningful difference to me. In the cases where the mound layers do differ from other contemporary contexts, they generally have fewer exotic materials. 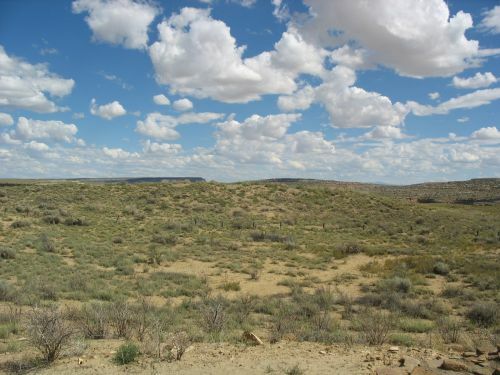 For example ceramics from the Red Mesa Valley comprise 3.3% of the event layers, 3.8% of the whole mound, and 4.6% of the contemporary non-mound contexts. 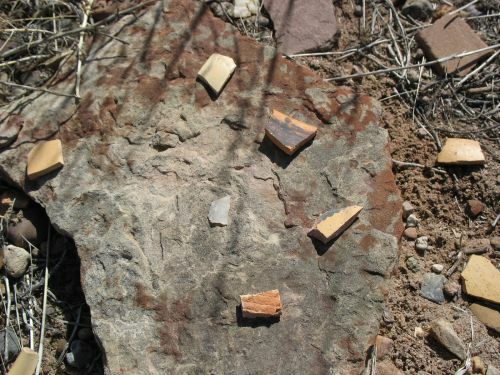 The presence of Narbona Pass chert is something of an exception, with the proportions for the event layers, the whole mound, and other contemporary contexts being 26.1%, 26.4%, and 19.5% respectively, but stone from the Zuni Mountains has proportions of 2.2%, 2.4%, and 10.9% (!) respectively, which suggests that there’s just no pattern here in which the event layers or the mound as a whole contain higher proportions of imported material. Basically, Chaco was awash in all sorts of imported stuff during this period, and it was not particularly concentrated in the mound more than anywhere else. The mound has lots of imports because there were lots of imports all over the place, not because it was formed as the result of annual pilgrimage feasts. The biggest difference between the mound and other contemporary contexts comes with the forms of pottery. 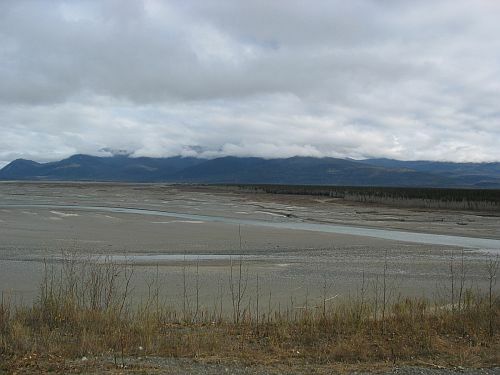 Generally, the forms of pottery found at sites in this area at this time are whiteware bowls, whiteware jars, grayware jars, and redware and brownware bowls. Red and brown bowls were long-distance imports and are found in small numbers at most sites. The other wares were local, at least in a general sense, and while there was surely some variation, the standard idea about functions is that gray jars were used for cooking food, white bowls were used for serving food, and white jars were used for storage. Thus, for feasting contexts an unusually high number of white bowls, and possibly gray jars, would be expected. Since red and brown bowls are likely to have had symbolic or ritual importance, given the distances from which they were imported, they may occur in higher frequencies in feasting or ritual contexts too. The pattern in the Pueblo Alto mound, while distinct from other contemporary sites, didn’t really match these expectations. The most obvious difference was a much lower proportion of white bowls: 27.0% for the event layers versus 32.7% for the whole mound and 33.4% for other contexts. This was balanced by a higher proportion of gray jars, which Toll interprets as still giving evidence for feasting, but this is mighty weak evidence for pilgrimage and feasting, even though the high proportion of grayware that came from the Chuskas during this period means that the high proportion of gray jars in the mound contributed to a higher level of Chuskan imports. Red and brown bowls were also much rarer in the mound (both in the event layers and in the whole thing) than in other sites. So, despite Toll’s efforts to show the data from the Pueblo Alto mound supporting his and Renfrew’s pilgrimage theories, I don’t buy it. That’s not to say that there was no pilgrimage or feasting at Pueblo Alto, of course, just that this evidence doesn’t show that there was any. And, remember, this is the only evidence out there for feasting and pilgrimage at Chaco. But what about those unusually large, distinct layers in the mound? Don’t those indicate unusual depositional events consistent with annual feasting and the deliberate breaking of huge numbers of pots? Well, no. To understand why not, we turn to the second paper published in 2001 on this topic, written by Chip Wills. Wills is a Chaco Project alum who worked on the Pueblo Alto mound excavations, so he knows what he’s talking about here, and what he says is that the layers in the mound aren’t at all necessarily evidence for annual feasts. Basically, what he says is that there’s nothing special about the layers in the mound. They’re not really bigger or richer in artifacts than deposits found elsewhere. He has a lot of specific criticisms of Toll’s interpretations and methodology, but that’s the gist of it. 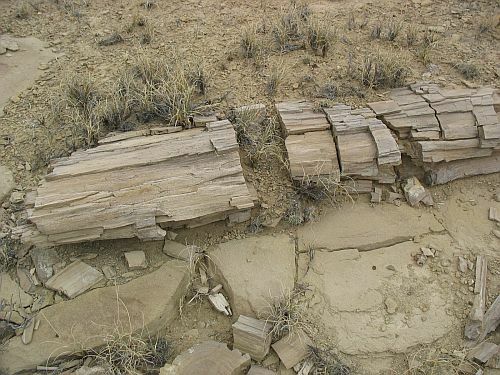 He says that the unusually well-defined nature of the layers could well be the result of natural processes on layers deposited in various ways, so that it doesn’t necessarily indicate occasional large deposits rather than steady trash accumulation. 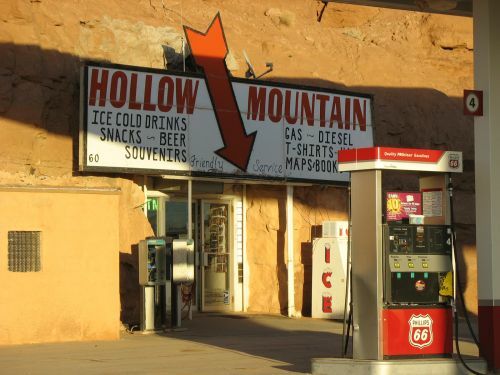 Most importantly, he finds that there isn’t actually a clear distinction between the “construction” and “event” layers, and that it’s quite plausible that the whole mound, or at least the vast majority of it, resulted from the deposition of construction debris from the various stages of construction and remodeling at Pueblo Alto. There would have been other “depositional streams” as well, including the dismantling of earlier architecture below the present site (which is known to have been present from the excavations). Wills doesn’t deny that ritual may have played a role in the creation of the mound, since the construction of the great house itself may well have been a ritual act, but he does deny that there is any sign that the actual contents of the mound indicate that it resulted from occasional ritual deposits rather than a combination of construction debris and regular trash dumping. Okay, but what about all those smashed vessels? Basically, Wills doesn’t find Toll’s calculations convincing. He says that Toll calculated the number of vessels based on the number of rim sherds found, then extrapolated that number to the whole mound based on the excavated portion. The assumptions here are that each pot is represented in the mound by a single rim sherd, and that sherd density throughout the mound is constant. Neither of these is really reasonable, although the “one rim sherd per vessel” one is particularly problematic. It was apparently based on the fact that few rim sherds from the same vessel were found, but what are the odds that only one rim sherd from each pot made it into the mound? Extrapolating the number of vessels is tricky, of course, and obviously the raw sherd counts can’t be a reliable way to do it (since vessels varied in size), but this rim sherd idea is questionable at best. The idea of uniform density is really just an example of a reasonable assumption given an unknowable reality, but it’s still not necessarily right. Wills mentions another estimate of 30,000 vessels for the whole mound, which he also attributes to Toll, and this produces much more reasonable per year and per household numbers suggesting that the observed sherd density could easily reflect regular domestic trash. He also notes that it was the number of households, based on architectural data, that was held constant when this seemed to conflict with the number of vessels deposited, but he doesn’t elaborate on the implications of this beyond noting the privileged place architecture tends to hold in population estimates at Chacoan sites. I originally read both of these articles a couple years ago when I was first starting to work at Chaco, and at the time I found Toll’s more convincing. Rereading them now, though, I find Wills more convincing, and his arguments have never really been squarely addressed by Toll or anyone else associated with the pilgrimage/feasting theory (although they are occasionally mentioned in passing). 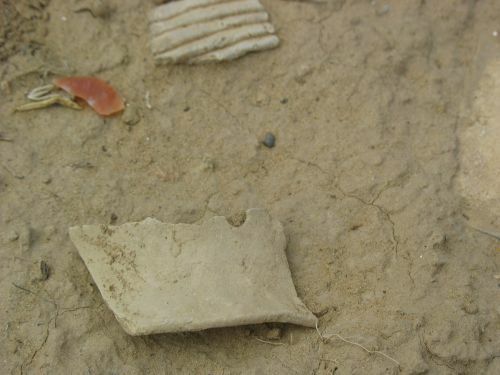 Chaco may well have been a pilgrimage site and the location of communal feasts, but it’s important to note that the Pueblo Alto trash mound doesn’t provide evidence for this idea, and neither does anything else. I’ve decided to do a series of posts on the issue of prehistoric weaponry and the spread of the bow and arrow through North America. 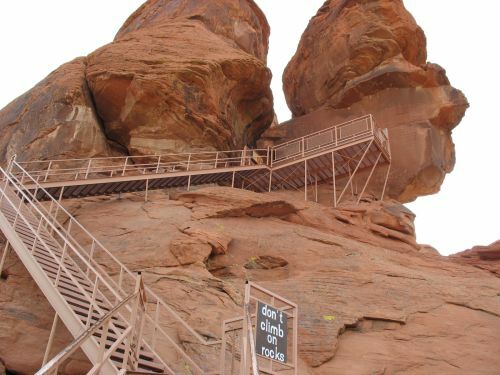 This is an important topic, and one that has received a considerable amount of attention from archaeologists and others over the past century. Despite that long history of research, there are still a lot of unresolved questions about this, and it has been a highly contentious issue in some circles. To frame the issue, and to demonstrate its importance to Chaco specifically and Southwestern archaeology more generally, I’d like to go back to a topic I haven’t discussed much lately: warfare, and in particular Steven LeBlanc’s book on warfare in the prehistoric Southwest. This is a controversial issue, although most Southwestern archaeologists seem to be coming around to the view that warfare was important even if they don’t see it as central the way LeBlanc does. 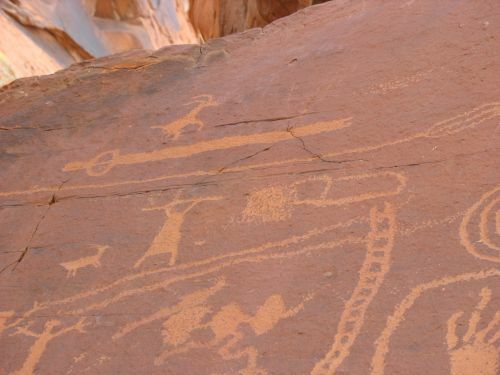 Leaving all that aside for now, however, LeBlanc also provides a useful model for the spread of prehistoric weaponry in the Southwest that clearly shows the importance of the bow and arrow. He uses weaponry type as one of the defining features of the three periods into which he divides Southwestern prehistory from the perspective of warfare. Each period is marked by the adoption of a new type of weapon, in each case more effective than the last. The periods don’t quite line up with the probable dates of adoption of the new weapons, however, which suggests that there was more going on than mere technological developments. This has to be the case, actually, because LeBlanc’s middle period (AD 900 to 1150, which roughly coincides with the Chacoan era) is marked by a noteworthy decrease in evidence for warfare despite coming not long after the introduction of the bow and arrow to the Southwest. LeBlanc’s early period, which runs from the first settlement of the Southwest up to around AD 900, was marked by endemic warfare among small groups using atlatls. The atlatl, known by various other names such as “spear-thrower” but in this context usually called by its Nahuatl name, is a tool used to launch spears (often called “atlatl darts”) with greater force and to a greater distance than is possible with the unaided hand. It is found in every inhabited part of the world starting in very early times, and probably dates far back into the Paleolithic Era, before the spread of modern humans throughout the world. It was thus presumably known to the earliest inhabitants of both the Americas in general and the Southwest in particular. 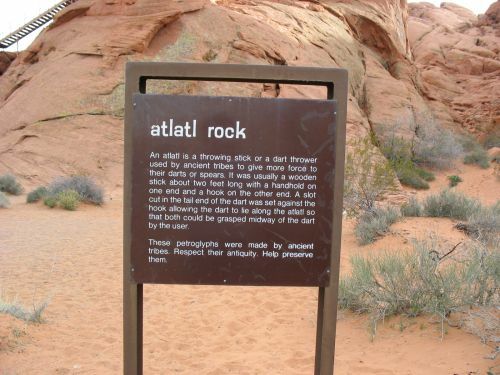 Most archaeologists generally think of the atlatl in a hunting context, and it would certainly have been used for hunting. LeBlanc, however, points out that any weapon used for hunting would also be useful in war, and since he proposes that war was going on constantly during his early period, it stands to reason that the main weapon would have been the atlatl. He also argues that the large wooden club-like artifacts found in sites of this era, often known as “rabbit sticks” and associated with hunting of small game, were instead “fending sticks” used to deflect atlatl darts. I’m not sure I buy this, but it does make sense that people fighting with atlatls would want to do something to defend themselves against darts coming at them and the sticks would work. Support for the idea that the atlatl was a weapon of war in addition to a hunting tool comes from Mesoamerica, where military use of the atlatl came to be a major feature of the very warlike societies there. 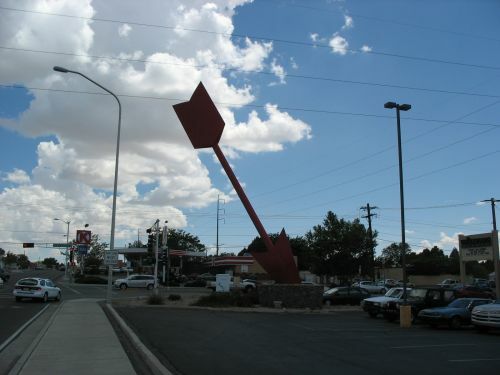 At some point near the end of LeBlanc’s early period, a new weapon system appeared in the Southwest: the bow and arrow. The spread of the bow and arrow is fascinating, since unlike almost all other examples of diffusion of ideas and technologies through North America it came not from the south but from the north. It originated somewhere in Eurasia very early on, and then spread very slowly to the Bering Strait, and from there on down the continent. The most interesting part, and something that I’ll be addressing in more detail in subsequent posts in this series, is that it’s possible to track the movement of the bow and arrow south from the Arctic by looking at the first appearance of it in rock art and artifact assemblages at sites in various areas. It reached the Southwest sometime around the Pueblo I period and immediately replaced the atlatl as the preferred weapon for both hunting and (presumably) war. It then continued to spread to the south, but for some reason it didn’t really catch on in Mesoamerica the way it had in most of the areas to the north. This may have been because of the cultural importance of the atlatl, but it could also have been because it had just barely reached central Mexico when the Spanish arrived and threw everything into chaos. In fact, I’m not entirely sure it got as far as central Mexico at all; I haven’t found any sources that discuss this precise issue, although there’s been so much attention paid to Aztec warfare that I’m sure it’s discussed somewhere. It definitely never reached the Maya. All these Mesoamerican groups were still using the atlatl as their primary weapon when the Spanish showed up with guns. LeBlanc’s late period, from AD 1250 until Spanish contact, is associated with the use of the recurved bow, which is a more powerful weapon than the self bow that had been used before and may have had something to do with the immense amount of violence that is evident in the Southwest during this period. This is an interesting topic in its own right, but I’m not really going to go into it in this series, which is more focused on the initial adoption of the (self) bow and arrow in various parts of North America. Okay, so, that seems pretty straightforward, doesn’t it? If there is clear evidence for the spread of the bow from Asia into North America and then south, where’s the controversy? Well, I was a bit too glib above in saying that the spread of the bow and arrow can be easily tracked by looking at its first appearance in the archaeological record in various areas. The general picture still holds, I think, but the details are muddled, and there is considerable disagreement among archaeologists about what counts as evidence for the introduction of the bow and arrow in some regions. The main reason for this is that in most areas, the actual bows and arrowshafts don’t survive, since they’re made of perishable materials. Nor, for that matter, do atlatls, at least in their entirety. 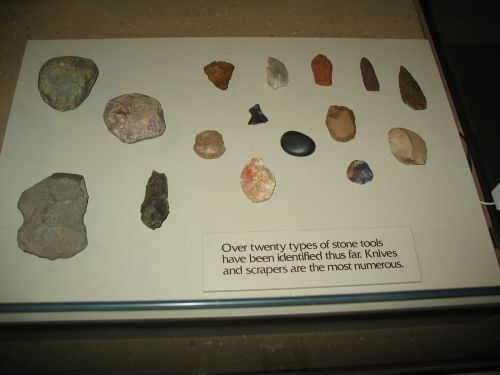 The main remains of both types of weapons are the projectile points, which are usually made of hard stone. 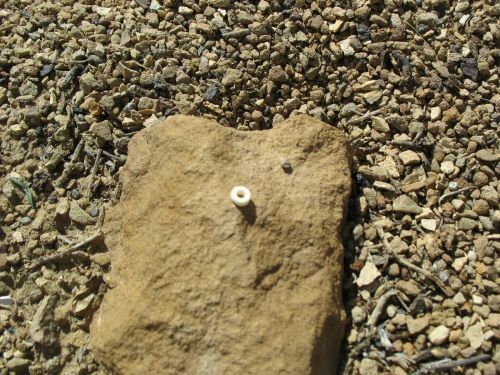 Atlatls also can have parts attached to them (known as “spurs” and “weights”) which are made of harder materials like stone or bone, and these can survive even when the wooden body of the atlatl doesn’t, although they can be hard to recognize on their own. In general, then, dating the replacement of the atlatl by the bow and arrow requires the ability to differentiate between dart points and arrowheads. Since atlatl darts are spears, it is generally thought that they should have bigger, heavier points than arrows, and size is indeed one criterion used to differentiate between the two types of point. This is controversial, however, for reasons that I’ll go into in future posts. 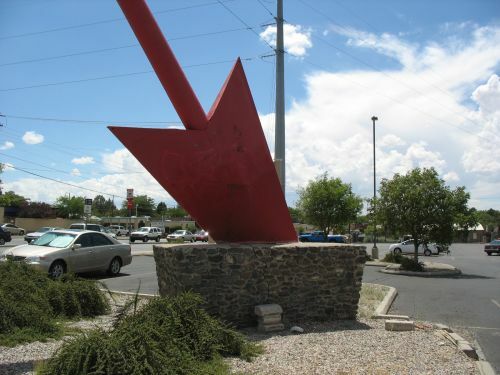 The entry of the bow and arrow into the Southwest, by the way, is dated much more precisely than is the case in other reasons, primarily because the much better preservation conditions in many Southwestern contexts mean that actual atlatls, darts, bows, and arrows do often survive, which allows a much better understanding of what they were like than is possible elsewhere. This has been very helpful in getting a sense of the situation elsewhere, although other factors mean that it can’t answer all the questions about those other places. 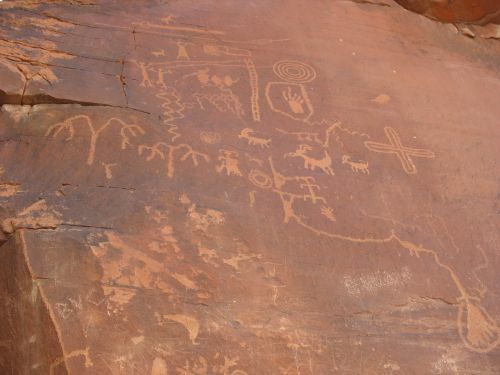 This importance of the Southwest to understanding the spread of the bow and arrow, despite not being the area where that spread either began or ended, makes this blog a good place for an examination of the issue, as does the importance of that spread to understanding cultural developments in the Southwest. Those developments seem to have something to do with changes in weaponry, although the precise connection is difficult to discern.